Give your HDTV what it deserves-a DVD player capable of dishing out high-definition resolutions. HDMI makes it possible to watch your current DVDs in HD resolution. You can choose the best resolution to match your HDTV - 720p, 1080i, or 1080p. 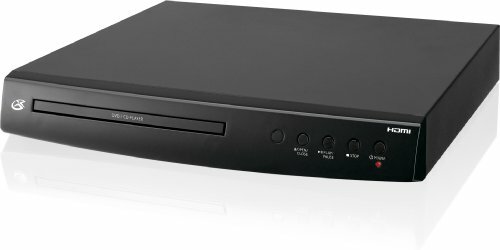 The GPX DH300B DVD player supports DVD, DVD+-R/RW formats as well as CD, CD-R/RW, and JPEG CDs. It supports 720p, 1080i, 1080p and aspect ratios of 16:9, 4:3LB, or 4.3PS. It is Dolby Digital Ready with the 2 channel stereo sound. Each drawer-load DVD player has outputs for HDMI, S-video, composite video, coaxial digital audio and RCA stereo audio. The multi-language on-screen display lets you adjust video and audio settings with the included full-function remote. Included in the box are the DVD player with a built-in AC power cable, remote control (requires 2 AAA batteries - not included), RCA audio/video cable, warranty card and a user's guide. For more than 30 years, GPX has offered one of the broadest portfolios of technology-driven consumer audio and video products. An award-winning consumer electronics company, GPX has built a solid reputation on excellent product quality, reliability, design, and affordability.